There it was – dinner – bread and cheese and fruit. I would make a simple soft lemon cheese made from only goat’s milk and lemon juice. It’s one of the easiest (and first) cheeses I ever made. Simply heat a quart of goat’s milk to 180 to 200 degrees. Remove pan from the heat and pour in ¼ cup of lemon juice, stir gently to distribute, cover pan with a lid and let stand for 15 minutes. 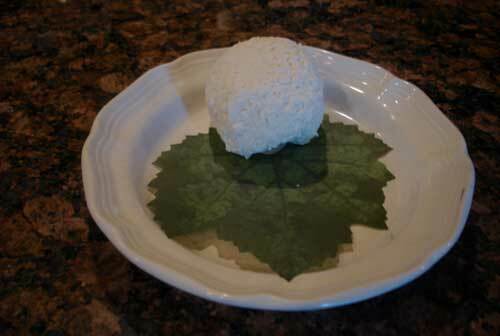 While it’s sitting, line a colander with cheesecloth or muslin and set over a bowl. After 15 minutes, pour the contents into the lined colander. Gather up the corners of the cloth and tie into a knot. Hang the cloth, over the colander and bowl, using kitchen string or your imagination. I hung mine from a knob on my upper cabinets. When the curds stop dripping, place them in a bowl and mix in 1/8 tsp of salt and a ¼ tsp of French herbs, stir to combine. At this point you can spoon the cheese into a mold or a ramekin. I just rolled in into a ball with my hands. Place cheese in the fridge for little while so it can cool. This cheese is rather soft and moist. If you want a drier more crumbly cheese just hang it longer. The 5-minute bread recipe has become one of our favorites. It’s so simple even DD makes it when she wants warm bread slathered with butter. This recipe makes a large batch of dough that can be cut into smaller portions before baking, reserving the rest for later use. The extra dough will keep for up to 14 days in the refrigerator, so you can have fresh bread every night. Add yeast, salt and sugar to the water in a 5 quart bowl. Mix in flour with a wooden spoon until everything is uniformly moist, then cover it with a kitchen towel. The dough will be wet and loose. Allow dough to rise at room temperature until it begins to collapse (or at least flattens on top), about two hours. Letting it rise longer is fine too. It won’t hurt it. I sometimes refrigerate the dough overnight. On a floured surface, fold the dough over itself once or twice, place it seam side down, cover again with a towel and let stand for 15 minutes. 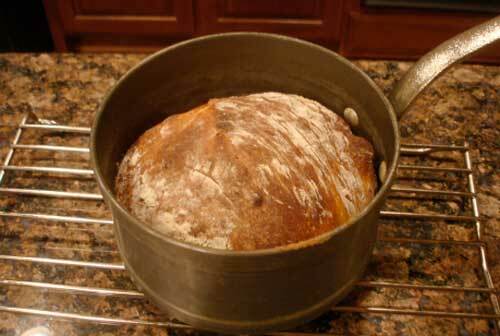 Preheat oven to 475, place Dutch oven or cast iron pot in the oven to warm. (you can also use baking dishes or bread pans) When the dough is ready, cut off the amount you want, shape it and place it in the pan, seam side down. The dough will settle into the shape of the pan. If it doesn’t look like it has risen much, don’t worry it will rise more in the oven. Dust the top of your loaf with a little flour and slash the top with a very sharp knife. Bake for 30-minutes, remove to a bakers rack and let rest for an hour — if you can wait that long! While the dough was resting, I sliced a pear from the espaliered trees I planted in spring. Chunks of the cool cheese were placed on the still warm sliced bread and I settled into a relaxing night of star gazing from the patio, enjoying the cooler night air. Sometimes a weary body needs the simple tastes of simple food.